Decorating your mantel for winter can be hard after putting away all the Christmas decor. 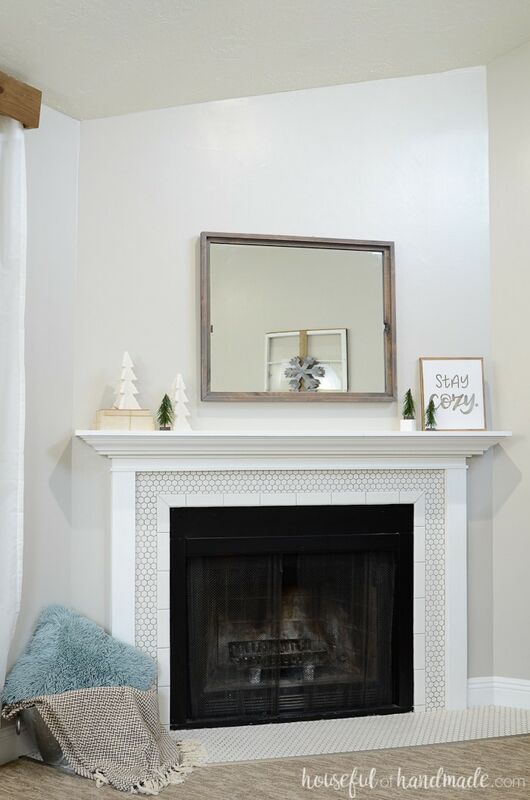 Keep it simple with a neutral farmhouse mantel and lots of clean space. 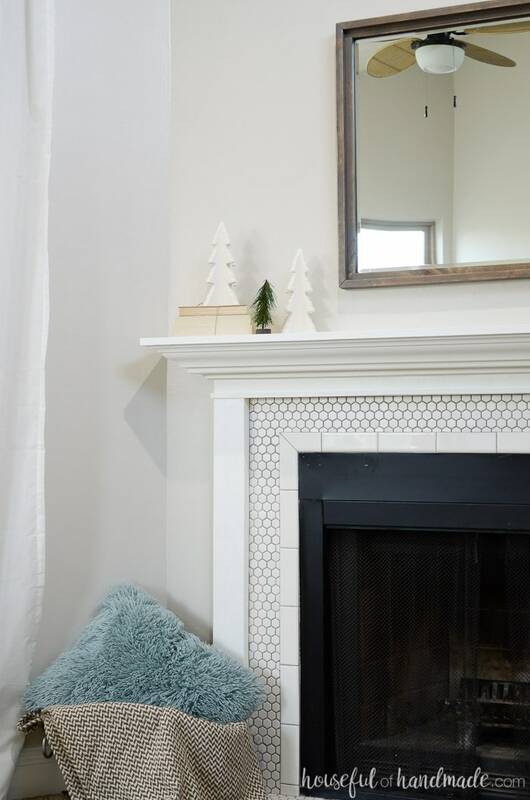 See how we transitioned to winter with this simple winter mantel. 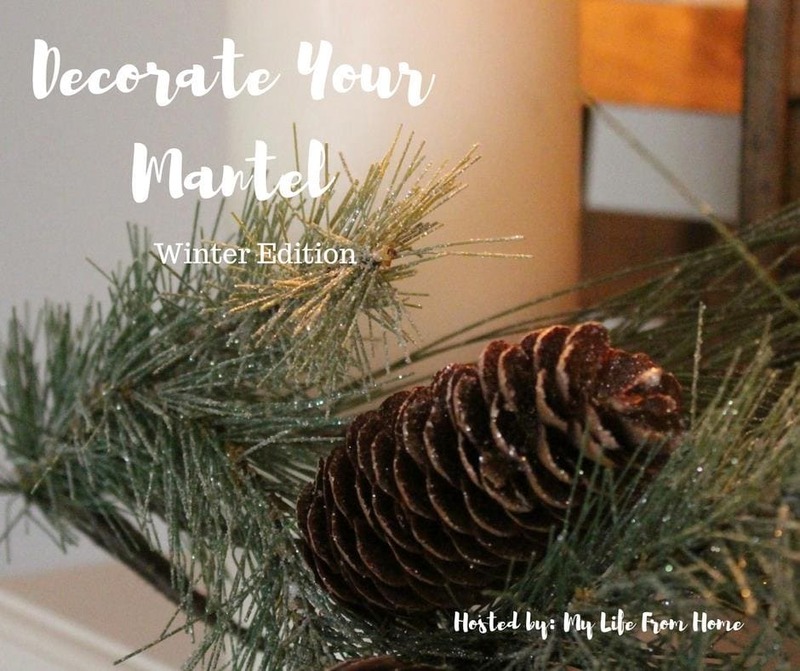 For this season’s Decorate You Mantel series, I put together a simple Farmhouse Winter Mantel. After taking down the Christmas decor, keeping things clean and simple with some classic farmhouse pieces was exactly what I needed. I was able to reuse a few of the trees from the Christmas tree farm mantel. 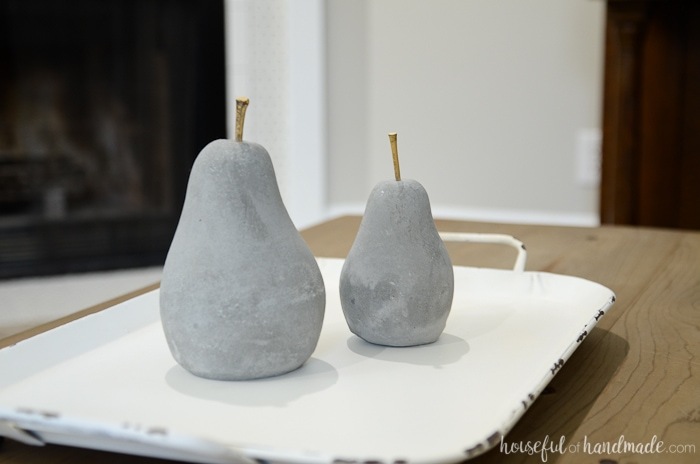 Then with a couple simple DIYs a beautiful winter mantel was born. This year I was really slow to take down all the Christmas decor. My dining room is still decked out in red and green. But it was time to clear the living room mantel of it’s festive Christmas tree farm and decorate it for winter. However, I still loved those trees. So I decided to leave some of the more neutral ones and make them work on my winter mantel. After deciding on what trees were going to transition the mantel from Christmas to winter, I needed to fill in the rest of the mantel. I started with the large DIY rustic mirror in the center. 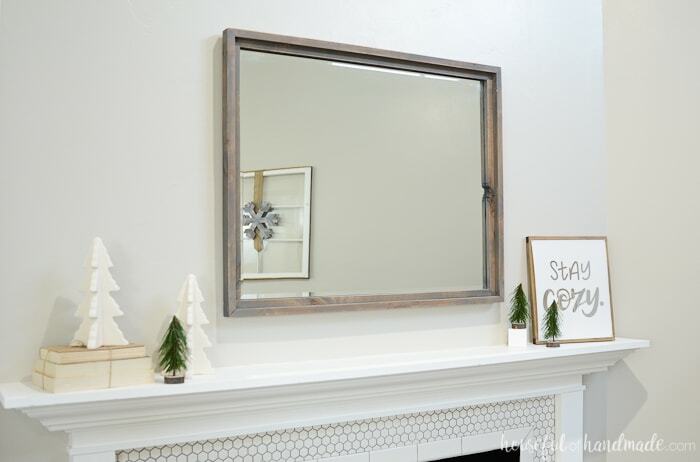 A mirror over the mantel is always a classic. I made this one from scrap wood left over from our rustic railings. And the gray stain gave it a beautiful rustic quality that is perfect for winter. Then I sprinkled the trees around the mantel. It was boring. I tried those trees in many, many configurations. Nothing was working because I needed some filler and height variations. I grabbed a few books and tied them together with some twine (and using some brown butcher paper to cover up the really colorful cover on one of them). Placing the spines backwards, I set them on the mantel as a riser for one of the ceramic trees. Instantly I love it! Now the other side was ready for something to balance it all out. 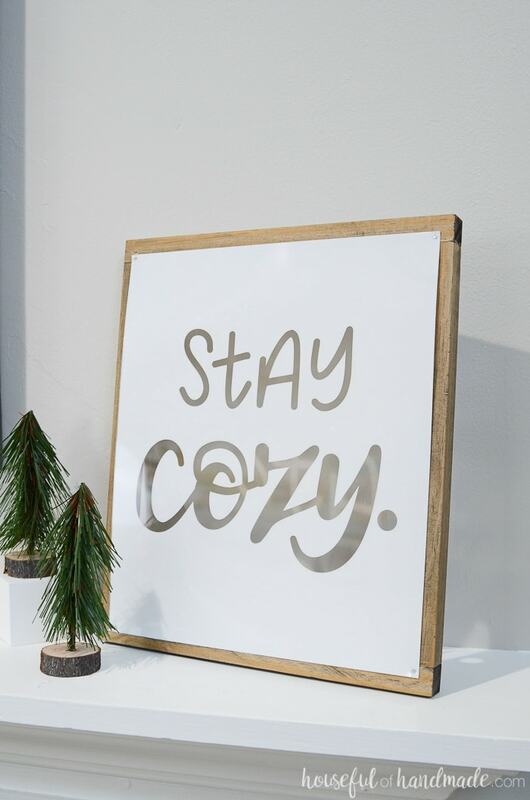 I love the faux metal farmhouse sign I made last year for our winter mantel. However, I didn’t love it with the other elements here because it was way too much gray. 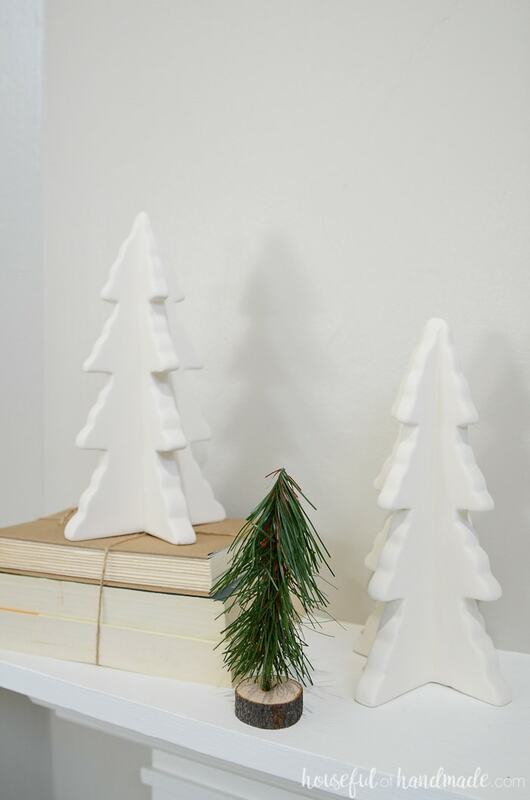 I needed something white to balance out the white ceramic trees and book pages. So I decided it was time to DIY another winter sign. I love our new winter sign. 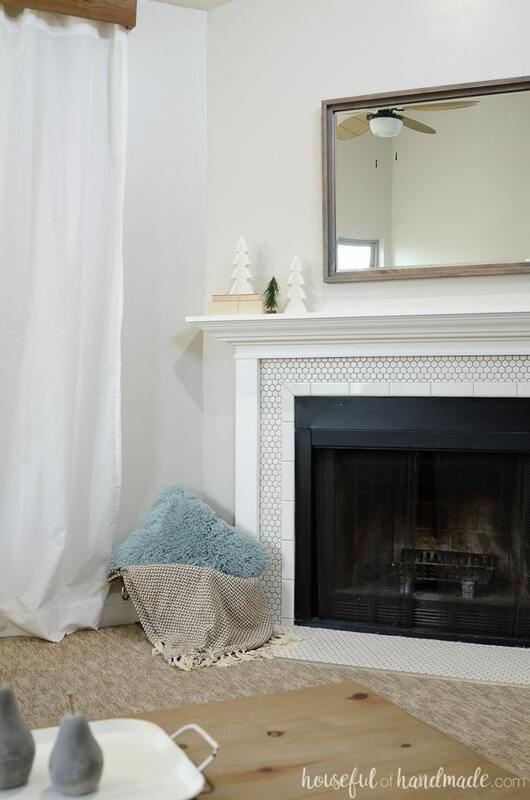 The white is perfect for our simple farmhouse winter mantel. The warmth of the wood frame adds another texture to the space. And it carries an important message for winter 😉 I found this beautiful hand written saying on So Fontsy. It’s a new online and font marketplace made for die cut crafters (and PS I will be selling my designs there too). Stay tuned for the complete winter sign tutorial. To add some height variation to the little trees on this side, I made a simple square box out of cardstock. The white box holds the tree up but really remains invisible on the mantel. Maybe I need to use this white cardstock box trick more often! And that is our entire simple farmhouse winter mantel. 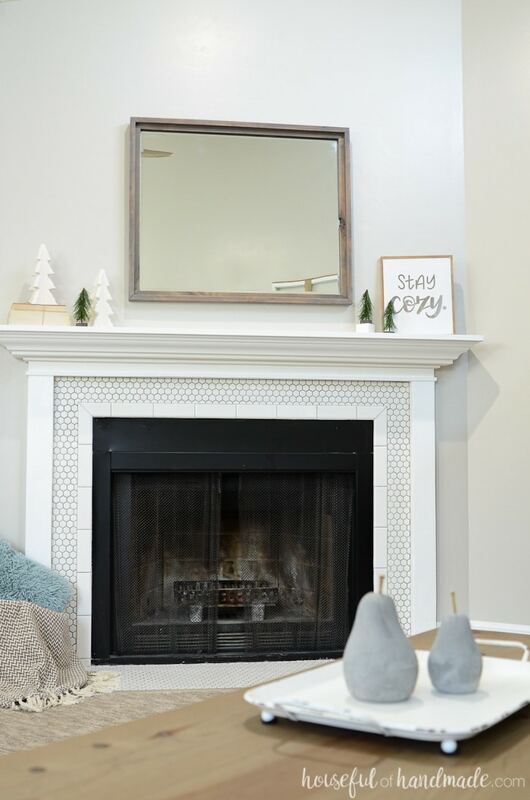 It’s the perfect neutral winter mantel to clear the palette between Christmas and spring! I hope you enjoyed it as much as I do. And don’t forget to check out the rest of the beautiful winter mantels below! Grab a cup of coffee and enjoy (you were planning on staying in anyway). This is really cute! I like how minimalistic it is, but it doesn’t feel stark or bare. It’s awesome! Thanks! I was worried that the minimalist would feel empty, but instead it turned out perfect! 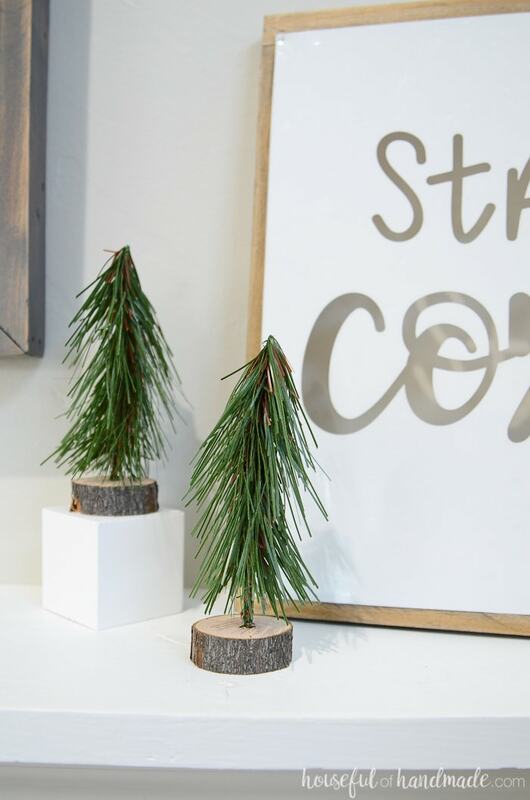 I love all of the little trees – and that ‘stay cozy’ sign is perfect! Thanks so much Emily! It’s the perfect place to cuddle in a blanket this winter! What a pretty farmhouse Winter Mantel! 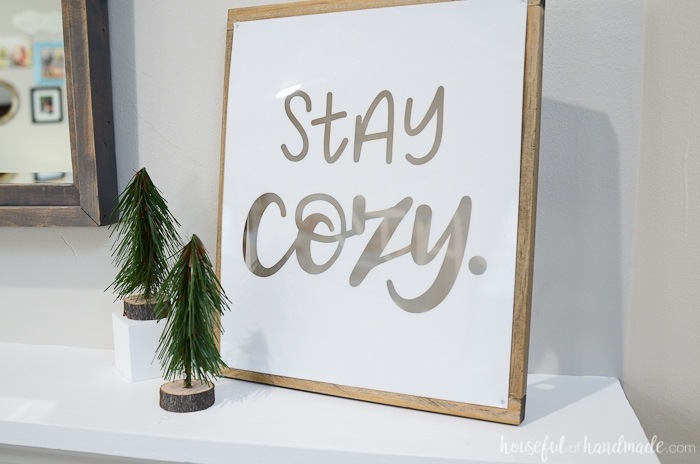 I just love the DIY sign-a perfect sentiment for cold winters! So simple and yet so beautiful! 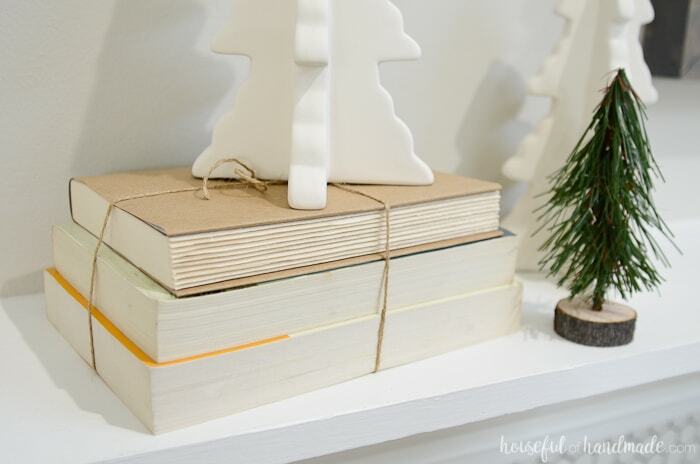 I love the trees and the books make for a great layer of texture. The perfect farmhouse look! love the simplicity and peacefulness of this setup! 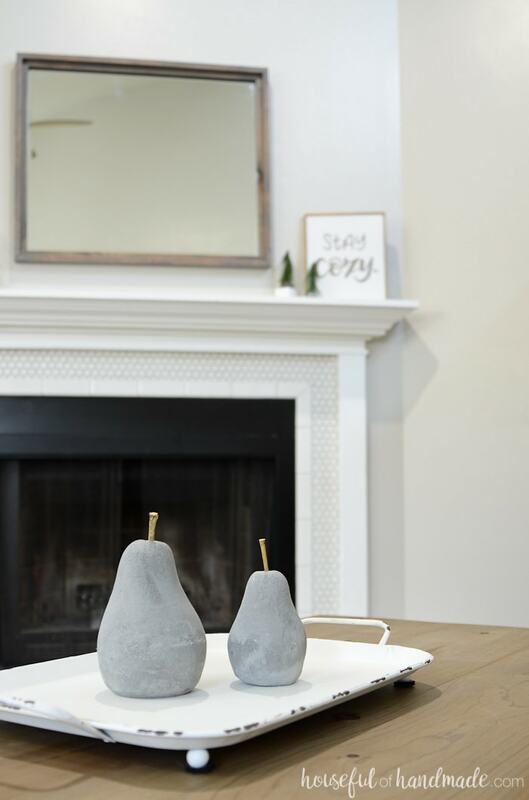 Hey Kati – your winter mantel is the perfect transition from the holidays. Love your creativity…those trees and sign are fabulous! Oh, and that gorgeous mirror! Thanks so much ladies! I love how it turned out.